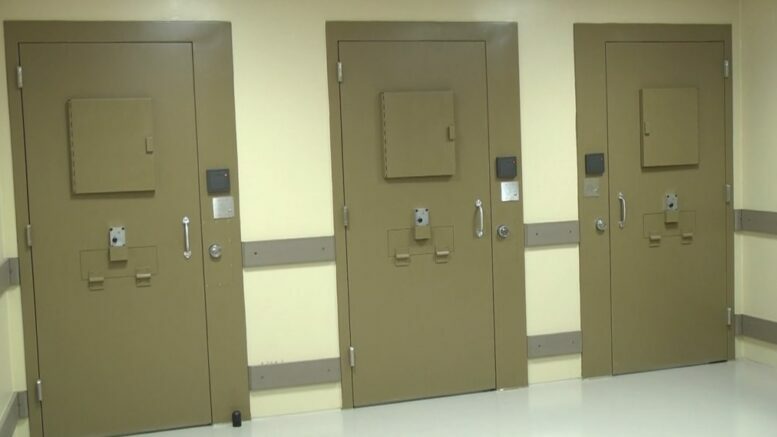 Three holding cells in the booking area of the new Delta County Corrections Facility. ESCANABA — Delta County held and open house Tuesday afternoon to show the community the new corrections facility in Escanaba. The new facility took over and renovated the Pathways section of the County Service Center building for the offices, a booking area, a new kitchen, and laundry room. An addition was attached to the building for the actual jail cells. It will nearly double the amount of inmates that will be able to be held at any time, which will help with the overcrowding that is happening at the current county jail. The added capacity isn’t the only new feature for the new facility. With the new design of the holding areas, which they refer to as “pods,” one guard can sit in the control room and see into every pod from the same spot. Each pod is set up for certain levels of classification for inmates, and there is even a pod in place for recreation. All of the doors in the different pods and cells are going to be controlled electronically from the control room, and with the new set up there won’t need to be more than five or six guards working at any one time. But, they aren’t ready to move in just yet, there is still a little more work to go, but they’re expecting to be fully moved into the new building this spring. If overcrowding continues to happen in the future they already have a plan in place. Certain areas, like the kitchen and the laundry room, were built to allow for a new addition of pods to increase the maximum capacity without having to make any more major adjustments to the building. Oswald said he had seen some jails that added space for more cells to increase the capacity, but they weren’t ready or capable to take on the additional inmates in terms of feeding them or doing their laundry. ABC10 will continue to keep you updated on the new facility and when they’ll complete the move out of the old building.